Everyone knows fashion is cyclical. But the key to understanding its enduring appeal is that people don’t live through that many cycles. 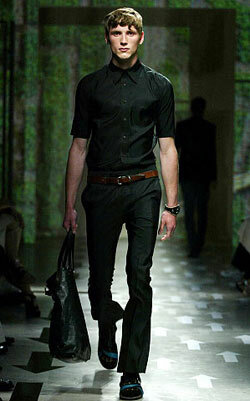 Slim trousers have been in the ascendancy in men’s fashion for almost a decade now. From their first daring suggestion on the catwalk, through gradual acceptance as the norm in high-end tailoring, to the point now where it is hard to find anything other than straight or skinny jeans in high-street stores. This is the end point: as soon as your mate Dave (who knows as much about fashion as he does about French literature – Beckham and the three musketeers is about it) is wearing narrow jeans, the trend is finished. The high street is saturated and the designers are searching for something new. That was the cycle. The next cycle will see a different shape dominate – bootcut is the current favourite. But because the cycle is so long, it could last the whole of your twenties. You will identify slim trousers with your youth, and bootcut will seem like a breath of fresh air – a more mature, flattering shape. It will seem like an original trend since, even though it was popular in the past, you weren’t around to wear it. The same would be true of baggy jeans or flairs. They may not be original, but that hardly matters. You didn’t get to wear them before. You really only get two of these cycles, possibly three. By the time you are into your thirties, you may stop noticing anything about trends or fashion. And even if you end up wearing the dominant shape of the times (by default, like Dave), you will hardly notice. You may even keep the same pair of jeans for decades – many men do. In my teenage years, bootcut jeans were probably the most fashionable. Hip-hop baggy jeans also had a slightly embarrassing following among white, middle-class kids. For me, therefore, the past decade and its narrow trouser aesthetic has seemed like a maturing time – one where straight, slim trousers with suits seemed like the obvious choice. The seemed timeless. Surely they are simply a realisation every man comes to after the follies of youth? In another five years I will probably be proved wrong. But by then I won’t care. Because baby carriers and combination boilers will be taking up much of my retail time; but also because I will have formed this attachment to slim, straight trousers at a formative age – one where I had a certain amount of time and disposal income to spend on clothes. It will probably be ingrained in me forever by then. So don’t criticise fashion cycles for being unoriginal. You only get two or three – enjoy them while they last. You can follow the discussion on Enjoy your fashion cycle by entering your email address in the box below. You will then receive an email every time a new comment is added. These will also contain a link to a page where you can stop the alerts, and remove all of your related data from the site. Once you know anything about the history of menswear, the idea of a single style being dominant is comical. I rejected my first cycle, am rejecting my current cycle, and look forward to rejecting the reaction to the current cycle. Is pluralism so hard to wrap your mind around? BTW: “The same would be true of baggy jeans or flairs.” That should be “flares”. He dressed with flair in his narrow jeans that widened into a flare at the ankles. This is a well written article. This is such a great post. I love that outfit. It make that man very elegant looking. I am sure that will fit me so well. I only recently came around to slim (not skinny… Christ, never skinny) trousers, many years after the style became so popular it was difficult to find anything but. I rebelled against the slimmer line all through my twenties, equating the look with idiotic teenagers who wear painted-on pants that make them look like Weebles balanced on toothpicks. Now I only wish someone had explained to me earlier that slim fitting trousers can actually be quite comfortable when the fit is right. I wasted my youth wearing shapeless baggy tubes.